A few of you out there who are new to the converting world have asked for explanations regarding several terms used within this industry. Perhaps the most common term that is at question is the term “slitting.” Slitting is a process by which material is cut to a specific width from a “master” or “parent” roll (a larger more difficult to handle roll). This master roll is made up of bulk material that typically cannot be inserted into manufacturer’s end products (normally due to is size). 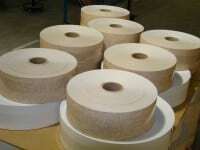 It can be summed up as taking one larger roll of material and cutting it into several smaller and more manageable rolls. During a typical slitting process, the master roll is unwound, travels through a series of blades that “slits” the material, and is rewound around a core that is suitable for the next step in the production process. The challenge for most manufacturers, especially those new to the industry, is finding a piece of equipment that will help speed up this slitting process and make their operation more efficient. There are thousands of different types of material and in most cases, one machine cannot slit them all. Under most circumstances, machines must be built to handle specific variations of the material in order to produce the best end result for the state of the material in question.